A Medical Supply Cart makes providing care and treatment easier than ever. With all necessary medicines and instruments close at hand, doctors and nurses can work as quickly and efficiently as possible. Getting your supplies where you need them is as easy as rolling your mobile medical cart into place. 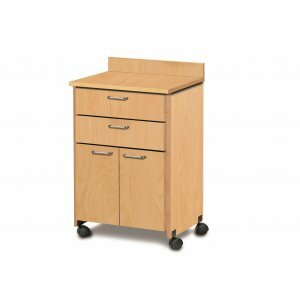 Dual-wheel swivel casters facilitate a fluid rolling motion while two drawers and an adjustable shelf keep everything organized and in position. 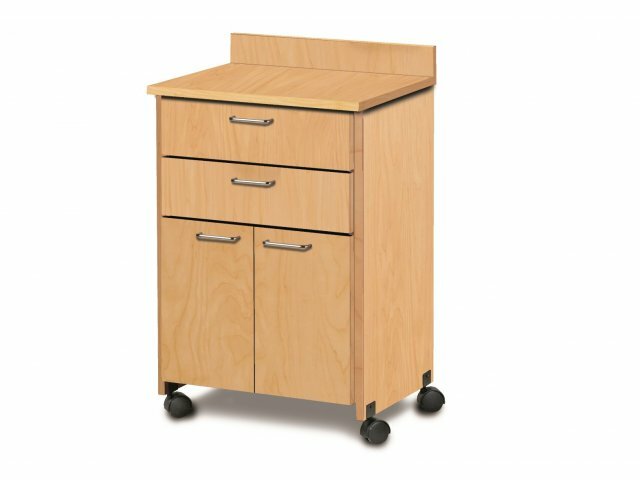 This medical supply cart is built to last with durable materials and a secure design. The textured top is rimmed on all sides to prevent objects from falling. Locking laminate cabinets with chip-resistant edges feature soft-close hinges and drawers open smoothly on one-piece metal slides. With a selection of colors and handle styles, you can coordinate your mobile medical cart with any space or color scheme. Non Slip: One-piece, vacuum-formed, textured top rimmed on all sides. Low Maintenance: Laminate surfaces are easy to wipe down, maintaining a sleek appearance for many years. Noise Reduction: Doors have fully-adjustable, concealed, soft-close, Euro-style hinges. Secure Storage: Locking doors and drawers keep supplies away from children. Perfect Fit: An adjustable shelf accommodates your particular needs. Sturdy Drawers: Smooth glide, Euro-style drawers have one-piece metal sides that support up to 75 lbs. Edge Protection: Tough chip-resistant edges keep your cabinets looking sharp. Smooth Rolling: Cabinet is mounted on dual-wheel swivel casters. Attractive Selection: Available in selection of solid and wood tone finishes with a choice of handles.